Although the SS United States now belongs to an organization dedicated to her preservation, she lies idle and deteriorating at her berth in Philadelphia. The SS United States Conservancy on its own does not have the money to revitalize the ship and release the potential inherent in her vast space. Unless a developer is found soon, the costs of berthing and maintaining the ship will exhaust the Conservancy's funds and the ship will be destroyed in a scrapyard. 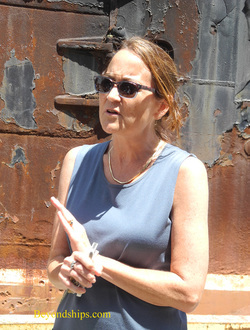 Susan L. Gibbs, Executive Director of the SS United States Conservancy, is spearheading the effort to save the SS United States. Ms. Gibbs is the granddaughter of William Francis Gibbs, the naval architect who designed the SS United States. Her career has been spent in the philanthropic sector both with foundations and with her own consulting firm. We spoke with Ms. Gibbs about the effort to save the SS United States. Gibbs: While the Conservancy “saved” the SS United States from certain scrapping when we purchased her in 2011, we only raised enough money to buy the vessel and cover her formidable maintenance costs for a couple of years. It’s very expensive to keep her docked, insured, maintained, secure, and afloat. We’re running out of money and time. Investors and developers have a crucial role to play in contributing to her restoration and future economic vitality. Beyondships: Someone taking a cursory glance at the peeling paint etc. might think that she is not in very good condition. Is it really too late to save the ship? Gibbs: It is not too late to save the United States! While her once vibrant red, white, and blue paint has faded to pink and gray, surveys conducted shortly before the Conservancy purchased the ship revealed the vessel’s hull strength at 92 percent because she was so overbuilt to begin with. We’ve picked up major momentum with a $120,000 donation from supporter Jim Pollin along with an additional $100,000 challenge grant. Every donation this summer will be matched 1:1 by Jim. This funding is absolutely crucial to enable us to keep the ship in the water as we finalize redevelopment plans. Gibbs: We continue to advance plans to convert the ship into a stationary mixed-used museum and development complex with a range of offerings, including retail, hospitality, office space, a performing arts venue, and an incredible museum and educational center, the SS United States Center for Design and Discovery. The Conservancy’s Redevelopment Project managed by Dan McSweeney is working tirelessly to attract investors and identify a viable long-term location for the vessel, and in many ways, we’ve never been closer to success. Opportunities in New York are particularly encouraging. Gibbs: While the SS United States has a passionate following, the U.S. government has not yet stepped up to help the flagship that bears her nation’s name. She was a convertible troop ship that never saw battle, so the U.S. military has not played a role in her upkeep and has expressed no interest in assisting with her restoration. While some members of Congress have voiced their support, none have prioritized her restoration. Former President Bill Clinton – and former SS United States passenger - has written letters in support but again, he has not yet truly championed the cause. It will be up to the people of the world to save her. Gibbs: We have received important support from a number of top-flight firms, including the National Response Corporation; Vedder Price; Greenberg Traurig LLP; Skuld North America; Palmer, Beizup & Henderson LLP; K & L Gates LLP; and Witt O’Brien’s. As redevelopment plans advance, some additional high-profile sponsorship opportunities will become available. Gibbs: A couple of years ago, the Conservancy asked all its members to answer the question, “Why Does the SS United States Inspire You?” and we received hundreds of responses. And I was deeply moved by the range of reasons as well as their intensity. Everyone is drawn to the ship for their own reasons. As for mine, I love how she’s an American symbol with a global following that is inspiring and unifying. Needless to say, politics in the U.S. are deeply polarized, but this ship inspires people from all sides of the political spectrum. Historically, she connected this nation and its people to the rest of the world. Her power and technological innovation and massive scale tell us that anything is possible. My grandfather used to say, “You can’t set her on fire, you can’t sink her and you can’t catch her.” And nobody ever could. She’s lasted this long: we must save her!